Today was such a nice day that I decided to walk around until I found a good place for lunch. This turned out to be good, because keep forgetting to go to the farmers market. They have a little stand that makes crepes, but I never walk by there on a Tuesday (until today). The place that makes them is Crepes at the Market. It is a casual but well run cart. No need for a cashier, there are four wine glasses, for $1, $5, $10 and $20's, you make your own change. They were busy the whole time I was watching, the line was short but there were always at least a couple of people in it. 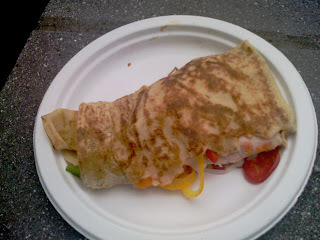 I had the Asiago, Turkey, Peppers, and Tomato crepe. The peppers were a colorful mix of red, yellow, and green peppers. The crepe was good, I ate it all pretty quickly. The turkey could have been spread out a bit more and I didn't get much from the Asiago cheese, next time I will try a cheese with a stronger flavor. If I remember, and if there is a nice day before the end of October, I will head back there again. 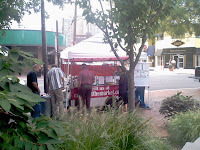 The farmers market is at Veteran's Park on the corner of Woodmont Ave and Norfolk Ave in Bethesda on Tuesdays and Saturdays from May through October. The park is supposed to have free wifi, but I was unable to connect to it, I'm not sure if it was their problem or if my phone was having trouble, I'll have to try again later. I went to the parks half-marathon this weekend. 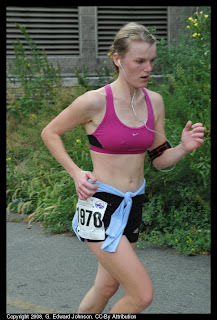 Not because I enjoy running, I certainly didn't run in it, but because I wanted to take pictures of the runners. I saw it as a kind of a challenge, to see how many of the runners I could take a picture of. I took about 1600 pictures in the hour and a half that I was there. They were limited to 2,500 entries and from what I could tell, they were all used, or at least close to it. There were only 2037 finishers. The race started at 7:00 am and they claimed you had to be able to finish in 2:45 or less, so everyone should have been done by 9:45, since they didn't start everyone instantaniously, add 15 minutes or so for the start and everyone should have been done by 10:00 am, right when I left. However, they let people finish until 10:25, so I missed about 50 people because of that. I also got there a little late and missed the first 25 finishers. I took multiple pictures of some people, but then, I also had cases where the same photo had multiple people in it, so I figure about 1,400 people I got a picture of, or almost three quarters of them. For the time I was there, I got a picture of virtually everyone. Sometimes a runner would be on the far side of a group and I wouldn't get a good picture, but if you finished before 10am, I almost certainly have a picture. Is that good or bad? It is pretty decent. The biggest problem I had was with people who had their bib number on their left leg. I had trouble getting the number in the picture which makes it tough to find them later. They had a bunch of rules, some good, some bad, for instance Runners must have their bib numbers visible at all times. Makes sense, but what is the definition of visible? any part of it? The whole thing? I saw several where I couldn't see the bib at all, a bunch where it mostly covered or crumpled so you couldn't read any of the numbers. To allow safe passage for all half marathoners regardless of their pace, please do not run more than two abreast during the race. Thats a nice sounding rule, but how could you possibly enforce it. And if you did, would it be fair? How would you pass someone if they were already running two abreast? I saw lots of runners in groups four across. Use of headphones...during the race is prohibited and will be cause for disqualification from the race. I saw lots of people listening to music and why shouldn't they? The roads were closed, so they didn't have to deal with cars. This is the dumbest rule they had. Here's a gem in the Results section "All results will be posted immediately as they are available at the finish line and on this web site." Followed by "Complete results will be posted on www.runwashington.com on Sunday afternoon and on this web site by Monday, September 15, 2008." So they claim that results will be posted on that website immediately, while also claiming that they won't be on the website until the next day. Did they even read this? So often you see a great offer, but when you look at the fine print you find lots of restrictions. It happens so often that I was suprised to see the opposite happen. The big print gives you restrictions, the fine print takes some of those restrictions away. I have seen this brand of gas station run this promotion a couple of times. 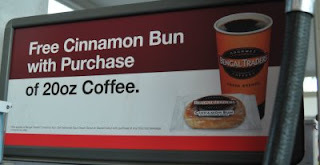 In big print it says "Free Cinnamon Bun with Purchase of 20oz Coffee" The small print elaborates on that, letting you know that instead of a cinnamon bun you can also have a sour cream donut or glazed donut, and you don't have to buy a coffee, you can get any 20oz hot beverage. Kudos to Exxon for doing this.